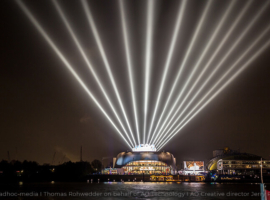 November 2014, Hamburg, Germany – In the FALCON BEAM 2, A&O Technology is introducing to the market a brilliant searchlight for rental applications. 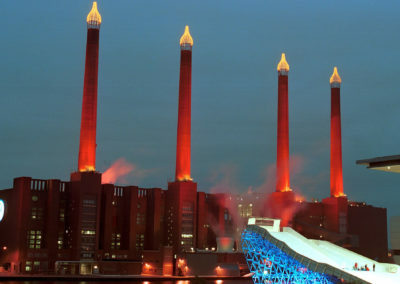 The new product range was deployed for the first time in a major production by director Jerry P. Appelt during the opening of the Stage Theatre on the Elbe in Hamburg. For the production of the theatrical light and laser show, shipping on the Elbe was brought to a standstill for a quarter of an hour. During this time, the entire Hamburg harbour was filled with shining light. The background music was the overture to the musical “Das Wunder von Bern”, which had been chosen to open the inaugural season. 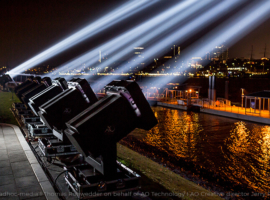 A&O Technology, which had been commissioned by PRG AG to provide the lighting equipment, supplied its newly launched FALCON BEAM 2 searchlights for their first live application on the banks of the Elbe. The German lighting designer Jerry P. Appelt integrated the searchlights into the lighting concept by installing some in four groups at the foot of the building along the riverside, whilst the main group was hoisted by cranes onto the roof of the new building. 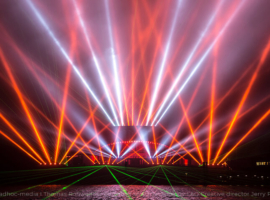 In this configuration, the searchlights projected light images visible from afar amid the play of fireworks and laser beams. 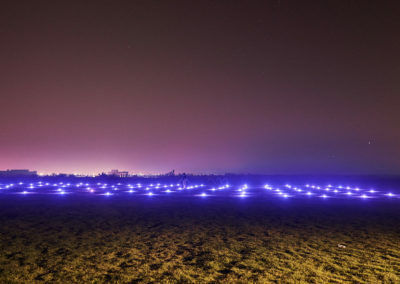 Around 1,200 spectators enjoyed the show. 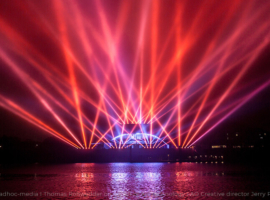 “The new FALCON BEAM 2 is the ideal fixture for large light shows and events. It is a agile rock star for touring and events lighting. 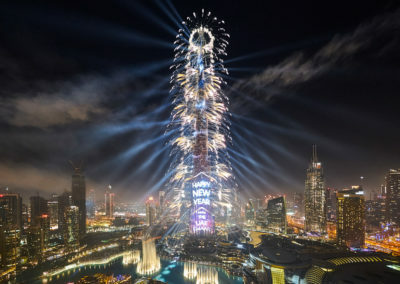 The searchlights push events optically and guarantee increased awareness throughout the surrounding area,” explained Marco Niedermeier, CEO of A&O Technology. Particularly magnificent was a still image: a crown composed of light beams that adorned the roof of the theatre. The FALCON BEAM 2 proved on this its first outing that it is the ideal fixture for this type of show format. The searchlight with its colour changer is notable for its brilliance and power as well as its reduced power consumption and compact design. 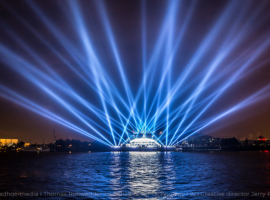 Rapid zooming and fast pan and tilt movements allow lighting designers to realize fluid, soft sequences of movements. With its prolonged service life, low maintenance costs and highly efficient optics, the FALCON BEAM 2 is a must for the equipment lists of all future events. The Stage Theatre on the Elbe is Stage Entertainment’s fourth theatre in Hamburg. With its twelve-metre-high reflective façade of stainless steel slates, it offers a constantly changing aspect. 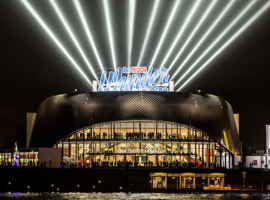 After London and New York, Hamburg is the world’s third most successful venue for musicals. The organizers opted for a home-grown German production, “Das Wunder von Bern”, to launch the first season.